Our next 4-week Salsa Courses will start on Saturday 4th May 2019. Registrations can be made by e-mail or directly through our website. Salsa drop in classes are offered on Monday and Wednesday. Our next 4-week Bachata Courses will start Saturday 4th May 2019. Bachata Drop in Classes are offered for Beginners and Improvers on Monday 8pm. Our next 4-week Kizomba Course will start SUNday 5th May 2019. Adult Ballet Drop in Classes are offered for Beginners / Improvers and Intermediate. Check Ballet under Dance Styles for classes details. Adult Contemporary Drop in Classes are offered for All Levels. Check Contemporary under Dance Styles for classes details. Adult Hip Hop Drop in Classes are offered for All Levels. 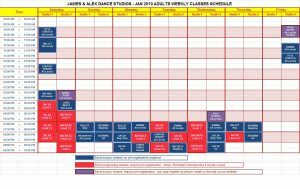 Check Hip Hop under Dance Styles for classes details. Adult Zumba Drop in Classes are offered for All Levels on Monday and Wednesday 7pm. Check Zumba under Dance Styles for classes details. We offer various dance styles for adults of all ages and levels. So no matter what your age is or how much or little experience you have, we have a class designed for you! To view any class changes or cancellations, click on the red button below. You can easily register for a class by setting up an online account. All our class rates are listed below. Please contact us for any clarification on rates for any particular classes. *All packages have a strict validity period (unless stated otherwise) and cannot be refunded or transferred to a third party. Become a member and receive discounts on our group class packages.